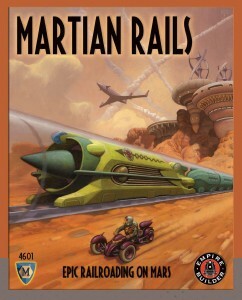 The latest in the Empire Builder series is Martian Rails from Mayfair Games. Because when you’re a railfan, there’s nothing that can’t be improved with the addition of trains. Oh, and the details. Two to six players, crayon-rails system (for the uninitiated, that means it’s up to you where to build the track), 3-D in the sense that you can go off one end of the board and on to the other end, and incorporates many elements from the long history of science fiction literature about Mars.